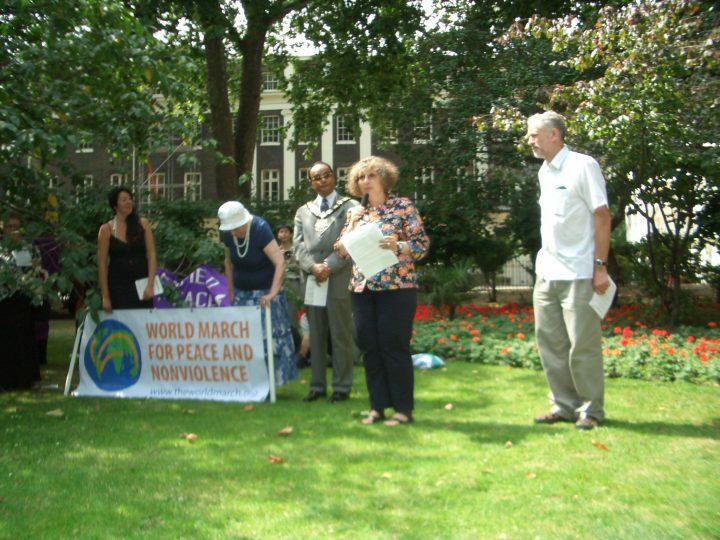 I reproduce here the presentation I gave for World Without Wars and Violence at the launch of the World March for Peace and Nonviolence (WM) in London on Hiroshima Day, event organised by CND and chaired by Jeremy Corbyn MP, now leader of the Labour Party. The WM travelled over 90 days through 90 countries in 6 continents carrying the message of the need to create a nonviolent consciousness and abolish nuclear weapons. This year the United Nations convened negotiations in 2017 that resulted in the adoption of the Treaty on the Prohibition of Nuclear Weapons. This new international agreement places nuclear weapons on the same legal footing as other weapons of mass destruction, which have long been outlawed. This Square with Gandhi’ statue is a very suitable place to announce the World March for Peace and Nonviolence given that the WM starts in its New Zealand counterpart. The horror of Hiroshima and Nagasaki has not been consigned to history. The images of pain and absurd death continue to live in our minds but at the same time they feed our profound aspiration for a world where never again will this atrocity be possible because it rejects all forms of violence and affirms the human being rather than money, or power, as the highest value. The first objective of the WM is the global elimination of nuclear weapons. This is the real emergency today. In order to neutralise Eisenhower’s beans spilling little piece of info that the Japanese had been looking for ways to surrender before the Bomb, the Americans, who went ahead anyway because they needed to test it, concocted this number: by ending the war a million American lives were saved by the bombings, confirming the (mis)quoted piece of Mark Twain’s wisdom “politicians use statistics like a drunk uses a lamppost, for support rather than for illumination”. Now a new generation of small nukes are considered to be a reasonable part of ordinary warfare. I’m afraid they need to test them. There we go again. Lab Iran? The World March for Peace and Nonviolence is an initiative originally launched by World without Wars and without Violence now working together with over 2000 organisations demanding an end to wars and nuclear weapons, withdrawal of troops from occupied territories, the signing of peace agreements between nations, renunciation of war as a form of resolving conflicts between countries and the elimination of all forms of violence, be it physical, economic, racial, religious, psychological, ecological, sexual, etc..
Over a period of 3 months hundreds of activities such as Forums, Concerts, walks, interviews with political and religious leaders (the Pope, Presidents of Finland, Bolivia, Ecuador and Chile) sports events and Educational activities will contribute to inspire a worldwide social consciousness in favour of a nonviolent culture. Linking up all these events a symbolic Journey from New Zealand on October 2nd 2009, Gandhi’s birthday and “International Day of Non-violence”, to travel for 90 days across six continents, to finish in the high Andes of Argentina on January 2nd 2010. The endorsers could not be more diverse: Archbishop Rowan Williams, Bishop Tutu, the Dalai Lama, Alex Salmond, Tony Benn several members of Parliament (Jeremy Corbyn is chairing this event), of the House of Lords and the Scottish Assembly, The National Union of Teachers in the UK. Several Nobel Peace Laureates, Croatia and East Timor Heads of State, former heads of state like Mary Robinson and Jimmy Carter, hundreds of personalities from the fields of arts, sports, science and education, Queen Rania of Jordan, the UN assembly president, Yoko Ono, Daniel Barenboim, Abolition 2000, Mayors for Peace and hundreds more. This March will create awareness and massive public support for the Review of the Nuclear Non Proliferation Treaty in New York May 2010 to set a date for Global Nuclear Disarmament. Torches will be carried by Mayors for Peace that will accompany the WM on the road to NY from Hiroshima and another from the UK’s south coast. The WM is not an umbrella; it is a resonance box for all, the convergence of diversity, each organisation with their slogans, their preferred issues, and their style. Not for the converted, to whom I am preaching shamelessly here. This March aims at the people who don’t normally think about these issues, who will hear about it at a concert, at a football match, at a BBQ, at a tango lesson, at a play, at school. And LOTS of it from internet. And the Media. A kind a giga Reality Show but with meaning. We know that 10% of the weapons budget can end all world hunger, and we should also recover the scientists’ brains engaged in developing weapons, nuclear or otherwise, for the real needs of humanity. It took a very long time to create an ecological consciousness, but we must create a nonviolent consciousness much faster, because the situation is critical. Proliferation makes fissile material widely available. A dirty bomb in a briefcase? The first one discovered under construction was not from a guy with a long beard, our pervasive media stereotype, but from a white supremacist from Belfast… Belfast, Maine, USA, that is, upset by Obama’s election. What’s special about Now? The WM “conjunction”. Period leading to the most important review of the NPT with Obama in charge making the right noises (the guy needs help, he cannot do it alone) and old hawks changing their tune: the late Robert McNamara called it “Apocalypse Soon”, Henry Kissinger, et al. The World March makes clear this is not about going out once (as many people hoped with Iraq) and then go home, because we didn’t win. We are part of a process that began many years ago, a celebration because we are still here, a connection between the fragments of the Peace movement worldwide, so that we continue the task reenergised and renewed.